Graphic design, photography and image restoration in Toronto: How to Shoot "Professionally" with the Canon Powershot G10. – Part II. How to Shoot "Professionally" with the Canon Powershot G10. – Part II. These are my usual settings for outdoor shooting at daytime: P-mode, ISO 80 and exposure compensation -2/3 EV. 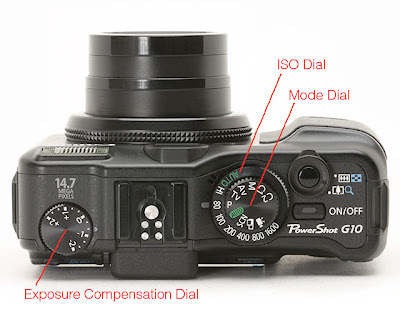 Why do you need exposure compensation? The camera has low dynamic range – it means it has problems with high contrast scenes containing both very dark and light areas. 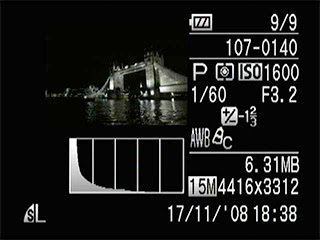 Automatic exposure is often calculated incorrectly, and the camera tends to overexpose. In these cases some lighter areas turn out completely white (highlight clipping). You can recover shadow details later in post-processing (though with some graininess and discoloration), but details in white areas are lost permanently and cannot be recovered. 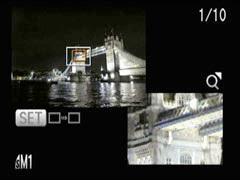 If important parts of the scene are clipped, manual exposure compensation is required. Fortunately, the G10 has the dedicated exposure compensation dial on top left of the camera that allows easy adjustments without going to menu. As a rule I set it to -1/3 or -2/3 for outdoor shooting to avoid highlight clipping. In some cases positive compensation is required. For example, shooting a winter landscape with lots of snow requires exposure compensation about +1 or more. Otherwise it would turn out dark and gray. When shooting against the light, flash can greatly improve the exposure. Even in bright sunlight use flash to fill shadows and make your photos less contrasty and more pleasing. You can adjust exposure before taking the picture judging by the screen, but the good idea is to check it afterward, too. After taking a picture, press DISPLAY button to review it. The G10 has 3 review modes that can be switched in cycle by pressing DISPLAY. 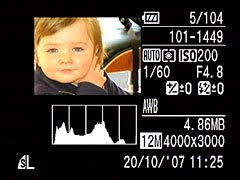 The first mode is full screen image review, the second shows the little image along with technical information like aperture, shutter speed, ISO, etc. In this mode overexposed (clipped) parts of the image are blinking. Below the image the histogram is located. It shows distribution of pixel brightness between black (left edge) and white (right edge). It is OK to have lots of black in night shots, but for properly exposed day shots brightness is distributed evenly across the histogram with blacks and whites close to zero. The third review mode is called Focus Check. A small portion of the image is magnified, and you can navigate across the frame using direction buttons to check focus of different areas. It is a good habit to check exposure, histogram and focus after each shooting. 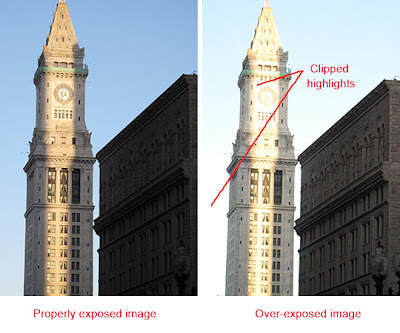 If any important details of the image are clipped or blurry, delete and reshoot it. Sometimes clipping cannot be avoided for very contrasty scenes. Try to keep main parts of the image exposed properly and sacrifice insignificant parts. If necessary, shoot several times with different exposure compensation. In some cases i-contrast can help, but I prefer to avoid it as it makes photos look artificial.